I will tell you upfront that vampire novels aren’t my thing. But because I don’t want to limit my preference by genre, I went ahead and read this book. I didn’t expect to really love it but I did! On the night of her 17th birthday, Sofia was kidnapped and was whisked away into The Shade where vampires live and the sun never rises. She became part of Derek’s harem and she must do whatever her master pleases. But what if, along the way, she falls in love with her very own captor? Will this result in doom for her? The story is told in both Sofia’s and Derek’s point of view which I like very much. It gives us a more dynamic view of the story. Though I wish that there was more to Sofia’s story before she was kidnapped. I would’ve liked it better if a lot of Sofia’s life has been told first before she was kidnapped by the vampires. But I think more about her will be revealed in the next books in the series. “What’s on your mind, Derek? she whispered. Nothing much or grandiose happened in the first book, though. The end was a downer to me but I do understand that this is just the intro to the series and more and more great stuff will happen as I continue reading the series. The novel is out of my comfort zone but I really like it! I’m glad I picked this book. For everyone out there, if you are into vampire novels, A Shade of Vampire is a must-read. Now I’m off to hunt a copy of this book’s sequel. 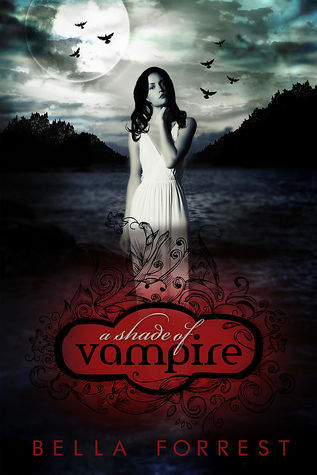 This entry was posted in book reviews and tagged 4, a shade of vampire, bella forrest. Bookmark the permalink. Hmmm…. Not sure about this one – the synopsis is pretty far out of my comfort zone and inst-love scares me and I’m thinking there might be some of that. I shall have to read a few more reviews I think. Thanks for sharing your thoughts on this one! I really hope you give this book a chance 🙂 Thanks for commenting! 😀 Happy reading. I’m going to have to check this out…thank you! !